Kanthamma was born in Bethany Leprosy Colony, In South India. Her father Sathireddy was severely disabled by leprosy and her mother, Anasurya was treated for tuberculosis several times in her life. Kanathamma looks a lot like her lean mother but she keeps in much better health. As a young woman she married NabiRassoul, a Muslim weaver and tailor who had been treated for leprosy and they had a little girl. Nabirassoul and Kanthamma were given a new house in Bethany but over time they were dissatisfied with the income from the weaving sewing programme and when the leader of Bharat Mata Kusht Ashram, a leprosy colony near Delhi went in search of a weaving master Nabirassoul decided to move north. He could manage to speak Hindi from his Urdu used amongst his Muslim relatives. Kanathamma had to learn the language which she and her daughter soon mastered and whilst NabiRassoul worked as a weaver she has remained active winding bobbins for the weavers. It has not been an easy transition and I am sure Kanthamma often wishes she was back in her hot southern home but their daughter is thriving, attending a private school and NabiRassoul weaves and tailors for MESH earning about Rs. 45,000 per annum which is supplemented with Kanathamma’s earnings from bobbin winding. 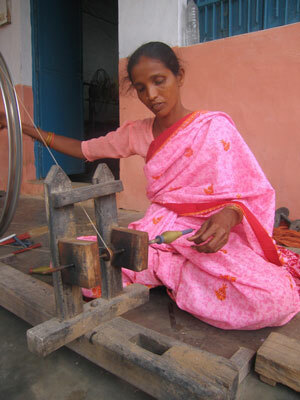 Her dream is that her daughter will become well qualified and find a good job for herself.